In line with Halloween, Nintendo has added Zombie Headwear and a Zombie Outfit to Super Mario Odyssey on the Switch. The dangerous headwear will cost 3,000 gold coins and the undead outfit will set you back 5,000 gold coins. This follows on from last month's addition of a Conductor wig and outfit. Does any of this content make you want to boot up the game right now? Will you be celebrating Halloween? 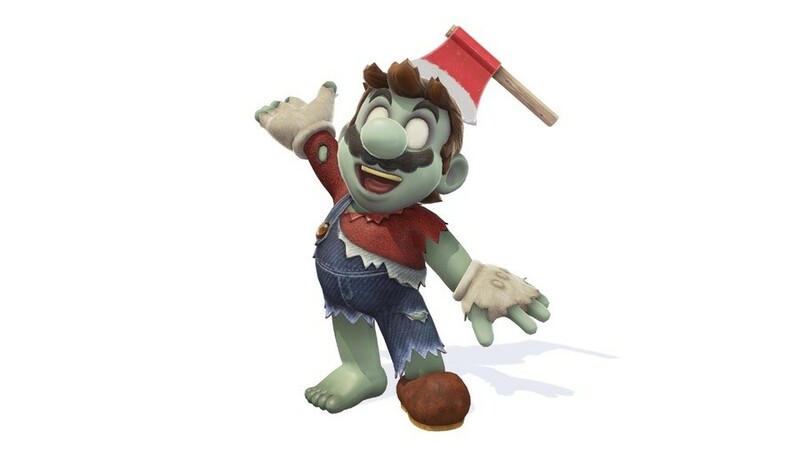 What do you think about this undead version of Mario with an axe in his head? Tell us below. I will skip that costume even still looked tame. Had to do a double take haha! Didn't expect Mario to have an axe buried into his head ! Now you can play as an undead Mario with the weapon of his murder entrenched in his rotting flesh! @Decapre how many costumes are there in the game now? it's amazing that all this stuff is for free. @huyi I think there's about 50 or so total outfits now, but the price is rather grindy. Like the Zombie costume is 3000 coins for the headpiece & 5000 for the outfit. Am I the only one surprised that Nintendo allowed A axe to be buried in to Marios head? @Decapre you would be there for ages trying to unlock it all, i remember how much grinding i had to do to unlock the gold mario costume too. but its' still impressive that this is all for free, anywhere else it would be paid dlc. Hey at least this one is not melting. Zombie Wario would literally rot away. @huyi Free except that it costs ridiculous amounts of in game currency, haha. I’m getting it. Love this costume. Obviously a rubber axe right? Oh wait🤔. That means you can throw the axe as well right? Yeah, I’m definitely getting this. @SetupDisk Children love this kind of stuff. Excellent. Will get it next time I'm on. Love the free stuff. Love how it's grindy, gives me more of a reason to do luigis balloon mode. @jhewitt3476 Why can't you do the system update? I suspect why. would take more then a zombie skin to make me want to return to that game. Ive had about one moon too many! @Decapre what's worst this and other released DLC outfits have been on the game card since it came out, modders had access to this months ago. I bet you're a real hit at Halloween parties. So, did the villager kill mario? Mario's a universe where the closet approximations of death are portrayed by flatting until the point of vanishing, falling very very far, magical disappearance in puffs of smoke, fully wrapped mummies walking about, or characters entirely constructed out of bleached white bones falling apart and re-assembling in a comical fashion. The most brutal portrayals of death in the games have always been Mario's own, (drowning, anyone?) but when they go with a green, no-pupils, axe-in-head and torn clothes Mario for Halloween, I'd still call it a bit out-of-universe. Of course, there's no visible wounds, blood, amputations, decomposition, or other flesh-rending maladies, and he still seems bright and cheerful. So it's not an offensive or scary image as such. But would Mario himself think this was a fun costume? Dear god, there's some real sissies here. I like it. Never expected this from Ninendo. Makes me want to go back and find some of the missing moons. I've already seen this costume somewhere a while back. Just forgot that it existed. Glad they made it official now. Looks like the Hammer Bros. Found a more effective weapon to hurl. @shonenjump86 Or, better yet, you throw Mario’s head. @jhewitt3476 why would you not want to update to latest OFW I wonder. Seems pretty likely that the 1.2.0 update content will be finished by The Game Awards, hoping DLC Kingdoms are a surprise announcement. @Dan_Dan: Yes, but he's not interested in getting his axe back, since he has the golden axe now. 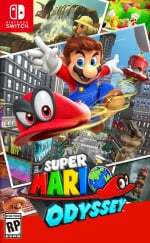 @Everyone_Else: It's slightly tame overall, but simultaneously specifically not for a Mario title. Honestly, I'm kinda curious if Nintendo is slowly experimenting with being slightly more mature-ish. I mean, there's this costume, which isn't very Mario-like, then there's Luigi getting killed in Simon's Smash trailer. Nintendo probably feels that they can, every now, and then, and that their Ips' images can take it. @Ryu_Niiyama So how do you handle the lore on this one? For 30-some years I've slammed Mario off cliffs, into bottomless pits, drowned him in water, had him devoured by piranha plants, flung into reciprocating saws, dropped onto large circular saws, dropped onto spikes, crushed by heavy stone blocks, immolated in lava, scorched by flame throwers, shot by countless bullet bills, trampled by dinosaurs, mauled by insane catepillars, blown up by bobombs, destroyed by giant squid, and run through by ghost pirates. And he has come through all this without as much as a scratch on his hat. And now a single axe has rendered his clothing in tatters, killed him, and resurrected him undead. The simulator Animus is fine. Props to Nintendo for kicking up their willingness to push towards more grit in their video games' presentations. The axe imbedded in Mario's skull, just mortifying. I wish this game had a more substantial(read : Luigi story mode) DLC. But I cannot complain about them offering outfits that would usually be behind micro transactions. And of course the news just had to pop up while I was about to go to work: literally this morning, around 7 AM in my timezone. Thankfully I had almost the required amount of coins when I got back home. The Manga filter is also lit, I plan on doing some cool stuff with that. It appears as though Mario was bit and turned into a zombie BEFORE he got an axe in the head. One doesn’t simply turn into a zombie by getting an axe to the head. Not going to complain about free content, but what is the point of these outfits..? They do absolutely nothing, and in a Mario game they're just really pointless. @NEStalgia you are poking fun but I already mentioned that games that don’t focus on lore/world building I just play. Villager got tired of mario being mr. Nintendo. I knew he was crazy. I did finally find someone as (or more really) annoyed with mass effect as i am though. Also animus is not fine. At this point it is an unreliable narrative device/narrator? and the fact that any info for the modern day plot that is gleaned from it is almost impossible. “I made most of this up using a book to frame the scenario but it led me to a real world item” that’s like using Ikaros in the game to find sunken treasure and then going there and finding it. They flipped the table for no reason. And Ubisoft thinks its good at combat again... its not. This game plays alsmost as badly as warrior within. Well, I geth I'll have to try Andromeda out one of these days and see just how bad it is! are you talking about the tv show ??? SMO is great, don't get me wrong. It just doesn't feel right... it was a single play through, complete main game experience for me. whereas ALL previous Marios I'd keep playing and 100%. It's just missing that magic I guess. These outfits, whilst a really nice freebie, just don't bring any magic. I really hope the sequel is a thing, and I have confidence that if it is, it'll be a truly great and magical Mario game. @jhewitt3476 LOL Yeah, only saw Hurcules in the beginning to (and never really liked him or that show and never watched it), but he grew on me fast. Not the best actor....with not the best directors.....but he became likable, if a bit wooden. I love that I still have so many moons to collect, cause it means I get to enjoy all this cool new stuff they're still releasing! @jhewitt3476 My apologies for that comment and it does indeed make me look like a jackass. It wasn't really meant to come across that way, it was worded poorly. Even if you had hacked it, I wouldn't be bothered, I'll be doing it myself once the next gen arrives. I done it with my Wii in 2012. The only reason I've not hacked the Wii U since buying the Switch is because I lost my Smash Bros disc. You guys need to grow some thicker skin. This is what I picture what Zombie Mario would say in his sleep "Night-nighty. Ah, intestines. Ah, brains. Ah, mama mia.